Today on the news we learn that dementia is now the biggest cause of death in our society. This means that more than ever before, affected individuals and their families have to live with dementia for many years before death. It is thankfully less of a taboo subject than it used to be but my own personal experience of watching my dad’s steady steep decline as a result of Alzeimers over a period of five years was helped by reading two very different books. I’m not saying that this was easy to put into practice but it explained why we had been doing it so badly wrong in the past – basically he was suggesting that carers needed to step onto Planet Dementia in all its weirdness and then try to see the world from a very different, often surreal perspective. If you could do that then it would be far less painful and sometimes even pleasurable for everyone concerned. The book is rooted in a personal family experience of dementia and also contains several case studies as evidence of what has since become an acclaimed therapeutic method. I didn’t use it as a handbook exactly but, as dad’s disease progressed I found it so helpful to be confident to try to agree with him rather than contradict him and to see him looking relatively relieved and relaxed as a result. I tried to let him take the lead in conversations which meant on one occasion that we could talk about his long dead mother as if she was still alive. Another time he visibly swelled with pride as he told me about his current work as an important research chemist and that he needed to make some phone calls, although he had been retired for at least twenty five years. He was happily back in a time when he was confident and assured of his place in the world and who was I to contradict him? What a powerful book – reading it completely shifted my perspective and made me feel as if I could do something useful. I have since recommended it to several other people, not everyone has liked it but I think it is worth a try. I came across my second influential book when selling children’s books on a stall for The Letterbox Library organisation at the university where I then worked. I was familiar with a lot of the excellent stock but never seen this one before and so when there was a lull in sales, I settled down to read it. I have reviewed the picture book, Grandma by Jessica Shepherd in some detail elsewhere and I still believe it to be the best children’s book that represents dementia as a ‘normal’ part of family life. 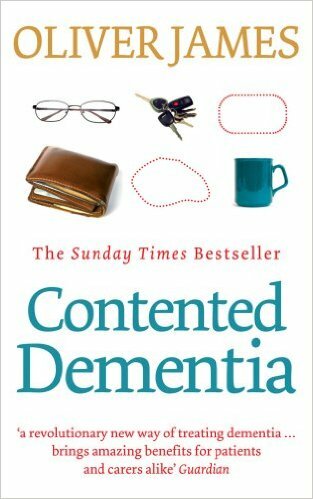 The author’s skill is that it presents the slightly askew world of dementia as experienced by a grandmother living in a residential care home in a very matter of fact way without suggesting that it is a lesser world. Instead it suggests that it is a rather interesting place to explore and nothing to be frightened about as long as you try to understand it. In this way it perfectly distils the Oliver James philosophy for readers of all ages. So many of us have relatives who need to be cared for in residential settings which can be daunting places to visit, but in this beautifully illustrated book they are presented as light, airy, cosy and colourful places full of potential new friends . Again, I have recommended this one to be used widely, particularly in nurseries and schools because it is so positive and reassuring. I was also very pleased when the manager at my dad’s Nursing Home purchased several copies to show to staff and to share with families with children. Both these very different books helped me to live better with the reality of dementia and I have been on the lookout for others ever since. I know that there have been several that share personal painful experiences of loss and despair and there will doubtless be more but they are not the ones for me. I will be looking out for other ones that provide a necessary dimension of hope and imagination. Whatever happened to compassion and the human touch?